Ready to enjoy an eco-conscious keyboard tray that matches perfectly with your bamboo desk? The Large Bamboo Keyboard Tray delivers ideal support with a dash of eye-catching beauty to workstations everywhere. Give your shoulders, arms, and wrists a tool that keeps you truly comfy at your keyboard. Made with sustainable bamboo, this tray features a roomy platform that's sized to hold both keyboard and mouse pad. With easy adjustments to your preferred angle and a gel palm support, your wrists will thank you for the gesture. Working at an L-shaped workstation? You have more installation options with help from a Corner Sleeve. 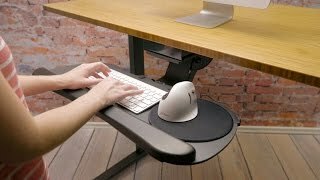 This handy little corner contraption gives you more freedom to install your keyboard tray on the inner corner of your desk. We think you'll agree - you're going to love feeling cornered. When you crave complete under-desk retraction but your desk requires crossbars, what's a person to do? Enjoy a keyboard tray that stows neatly underneath your desk with help from a Track Spacer. This gives you the ability to install desk accessories over crossbars needed to stabilize heavier desks. The highly adjustable, ergo-friendly Goldtouch Adjustable Keyboard is a fitting sidekick to our keyboard trays. Give your hands the best keyboard for supporting them throughout a variety of typing tasks. What's so eco-friendly about bamboo? We love using bamboo because it's sustainable and good for Mother Earth. Bamboo is one of the fastest regenerating wood materials, growing up to a lanky 39 inches a day! We responsibly source our premium bamboo from around the world, and top it off with a solvent-free finish that keeps the tray protected for years of work while keeping your indoor air quality pure. Should I go with the Switch Keyboard Tray, the Large Keyboard Tray, or the Large Bamboo Keyboard Tray? If you like working with a separate mouse platform, then the Switch Keyboard Tray is ideal for you. However, most users find that the single surface on the Large Keyboard Tray and Large Bamboo Keyboard Tray works great for them. It really comes down to your personal preference and if you want to type on a bamboo surface rather than one made from phenolic, like the Switch and Large Keyboard Trays. I have limited space under my desk. Will this keyboard tray still work for me? If you have limited space underneath your desk, you'll want to use the included 11" track when installing your tray. Although your keyboard tray will not be able to fully retract underneath the desktop, you will still be able to rotate the keyboard tray up to 360 degrees to stow it away neatly, preserving the clean look of your workstation. What's a track spacer? How do I know if I really need one? The track spacer is a smart invention, and you'll probably be glad you bought it. The track spacer mounts over the crossbar of your desk, which runs the length of your desk. You can then install your keyboard tray directly to the track spacer, so you will be able to fully retract your keyboard without colliding with the crossbar. Here's a helpful video we made about track spacers. Can the keyboard tray raise above desk level? Yes, the Large Bamboo Keyboard Tray can be raised three inches above its track. If you have it mounted directly to the desktop, then it should raise higher than the desktop's surface. However, if you're using a track spacer, which drops it down a few inches, then it might not reach desktop level. I installed my keyboard tray but it won't lower. Did I do something wrong? Probably not, it's more likely that you just forgot to remove the shipping pin. Check step four of your instructions - lift up on the front of the tray while lowering the back to relieve pressure on the pin. Then you should be able to remove it and start using your keyboard tray. Is there a special way I should clean my keyboard tray? To clean your keyboard tray and palm support, just wipe it with a Lysol wipe or spray disinfectant! Just be sure not to leave liquids sitting on the surface too long, as this can ruin the wood's finish. What are the dimensions of this keyboard platform? The Large Bamboo Keyboard Tray platform is 27" wide by 11.5" deep by 0.25" thick. Do I have to lock the keyboard tray in place? The tray's lift-and-release mechanism makes adjustments easier than ever. Simply lift up, move the keyboard tray to your preferred height and it will lock in place once you release it.